This is a favorite family recipe! For an 'on the go' breakfast, I serve these to my family in plastic, disposable cups with a straw when they need it 'on the go'. 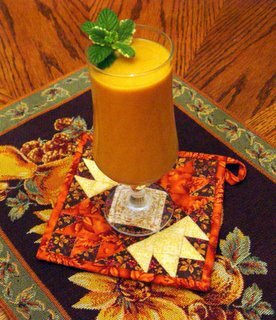 What a delicious way to get Vitamin A! This smoothie was garnished with pineapple mint and spearmint. Place all the ingredients in a blender. Blend until very smooth. Delicious! Serves two. ***We enjoy this recipe year around. There's supposed to be a shortage of pumpkin this year because of flood conditions where pumpkins are grown. So --- to be prepared, we bought a case of pumpkin! It was even on sale for the holiday. Cooking with pumpkin is very healthy and delicious! My parents used to make a hot pumpkin soup! Thank you for your sweet compliments on my placecards! The font is Normal Harrington from Microsoft Word and the size is 26. I have some antique sheet music that I am going to copy and make small scrolls out of to place at each setting with things I am thankful for about that person too. Then the rest of the magic will be in the kitchen!! WOOHOO!! And I just love praising God for all of His many blessings, don't you??!! May your celebration of thanks be filled with joy and memory making moments! !